This is the fourth article in a series on hikes in DC that can be reached by public transportation. We begin our next installment of car-free hikes in DC just upriver from where the last one left off. The C&O is a 184.5 mile-long canal that was built to transport goods all the way from Georgetown to Cumberland, MD. Many sections are now defunct, but the towpath – and green space on both sides of the canal -- is maintained as a National Park. All that water attracts birds, turtles, and amphibians, and supports lush woods. Many places along the canal also offer access to the Potomac. Consider how amazing it is that this humongous thing that was built entirely for industry and profit has become such a haven for plants and animals -- and a thing of pure joy for so many people. It's not so often that things go in that direction. Here are a few easily-reached spots to access the towpath. This map follows the section of the canal that goes through DC from Georgetown to Great Falls. Georgetown Visitors Center (1057 Thomas Jefferson St.; mile 0). 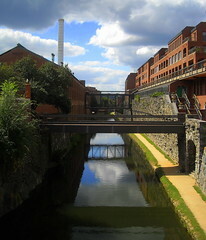 The beginning of the canal can be reached off Thomas Jefferson St., south of M St. in Georgetown. It's about a mile walk from Dupont Circle Metro and a little less from Foggy Bottom. There are also shuttle buses from Dupont, Foggy Bottom, and Rosslyn. At the headquarters here you can pick up park maps and occasionally ride on a barge in the canal, led by an interpreter in period costume. (202-653-5190) This is definitely not the most scenic part of the canal, but it's much quieter than M St.
34th Street (about mile 0.4). The western end of Georgetown is another option for entering the canal. From the south end of 34th St., you'll cross a pedestrian bridge over the canal to reach the path. Turn right, and once you cross under the Key Bridge and the Whitehurst Freeway, you'll be in the woods. You can follow either the paved Capitol Crescent Trail, or the packed dirt towpath. Numerous buses serve M St. from different directions; enter your address with a destination of 3400 M St. NW into WMATA and see what you come up with. Fletcher's Boat House (4940 Canal Rd; mile 3.1). This concession rents not only boats but also bikes; they also sell bait and tackle. The D3 and D6 buses stop at the intersetion of MacArthur Blvd. and Reservoir Rd., about half a mile away; you can catch one at Dupont Circle or Metro Center. Capital Crescent Bridge (about mile 3.6). Up until this point, the towpath and the Capital Crescent Trail have been on the same side of the canal (the Potomac side). Near the intersection of Arizona Ave. and Canal Rd., the Capital Crescent Trail crosses back over the canal and goes its own way. You can use this as another access to the towpath. The same D3 & D6 buses that stop near Fletcher's Boat House stop at the intersection of Arizona and MacArthur Blvd. It's about .3 miles to the canal; follow Arizona Ave. south. That should get you started. Is anyone aware of good car-free access points further out? Leave a comment. Dogs: "Dogs are welcome throughout the park, however it is important that they are kept on leashes to ensure the safety and comfort of all of our visitors and to protect the park’s flora and fauna. Dog owners are also expected to collect and remove their pets’ waste." Bikes: Absolutely. But the towpath isn't paved, and can be rough in spots; you want something more rugged than a road bike. Bikes can be stashed on the front of any Metrobus; you can take your bike on Metro anytime on the weekend, and anytime except 7-10am and 4-7pm during the week.